Last year, I thought that shopping for toys for Norton’s Christmas was hard. 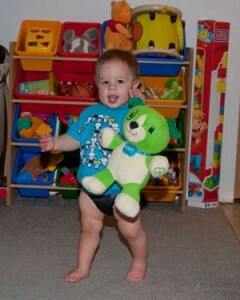 He was only nine months old, and there really aren’t a whole ton of toys for that age group. The older a baby gets, the more there is to choose from. Still, in the end, Norton got a ton of toys to play with… some of which are toys that he didn’t develop an interest in until roughly six months ago. This year, I’m struggling with Christmas gifts for Norton. I’m not struggling with toddler toys because of a lack of selection. 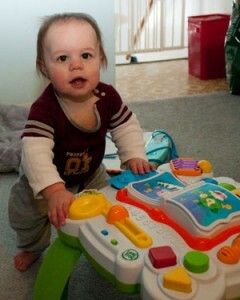 I’m struggling with toddler toys because I want good stuff that he’ll play with for a long time. I don’t want to throw my money away on crap. So I did what any reasonable, research obsessed mom would do. I checked the “hottest toys of 2011” lists. And that’s when I started to run into problems. 2.) Something educational that talks to your kid. Preferably in the form of a stuffy. I’ve seen the Fisher Price Laugh & Learn Learning Puppy listed. I’ve seen the LeapFrog My Pal Scout (and his girlier version, My Pal Violet) on the list. Here’s the thing: Norton got Scout from Santa last year. He loves Scout. Before Norton was converted from a crib to a toddler bed, he would sit up in his crib and play with Scout after he was supposed to be sleeping. Actually, he still sits up and plays with Scout after he’s been tucked into bed. But whatever. He loves it. But since we already have Scout and we have the LeapFrog Learning Baby Tad at Grandma and Grumpy’s house, I think we’re pretty set for talking educational stuffed animals. Unless we find one that’s really cool and does something different, like dancing or something. Maybe. 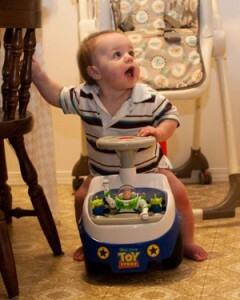 Riding his Toy Story toy! 3.) A really cool ride on toy. Want to guess what Norton got for Christmas last year? His grandma bought him a little Radio Flyer Classic Bumper Car. That lives at Grandma and Grumpy’s house so that Norton can have different toys to play with when he’s over there on Sundays (or whenever Grandma helps us out by baby-sitting). And his Uncle Eric got him a little Toy Story 3 riding truck, complete with noises and Buzz Lightyear in all of his glory. I’d love to get Norton the classic Jolly Jalopy like I had when I was a little girl, but the husband will put a kibosh on that. For one, we don’t really have any place in our house for him to use it. And there’s no way we’d use it during the winter outside. As much as I loved mine, the simple fact is that they don’t actually have any traction, so it wouldn’t really do that well in the snow. So, yeah. Those are the big three common suggestions. And, while, yes, I do agree that they are all wonderful toys, what do you give the toddler who has a ton of stuff? We’ve already gotten a little bit of shopping done, but we’re nowhere near finished. What kind of toddler toys are on your Christmas shopping list? Melissa and Doug Food Toys (as well as a couple of other companies that make similar ones. My toddlers love, love, love playing with their velcro veggies to slice and pizza. For Christmas they are getting Melissa and Doug Cookie Set, Bon Bon Tray and Ice Cream Cones, as well as a salad kit and a sandwich kit from other companies. Does Norton have the Mega Block Table? We recently picked that up as well. We’ve got Mega Blocks, and we have some more that we’ve bought for Christmas. 🙂 Kid LOVES playing with blocks. We had two bags of mega blocks…then the table went on sale for 67% off…and came with more blocks…but it does allow for more creative building too. The base has 4 pieces that can be oriented different ways (one way makes a track and it comes with 1 car and large little person). Playdough, paper, crayons, finger paints, stickers, maybe a crocheted toy If I can get up the nerve to try making one. Of course, my girls are a bit older, but it’s roughly the same kind of stuff they’ve been getting for Christmas since they were toddlers. My girls love art supplies, and they use them all the time, so they always need more. Big blocks are great for toddlers too. We got some for our girls when they were one, and the eldest is still playing with them at five with no hint of loosing interest any time soon. Okay here’s my section. I picked these from Amazon http://astore.amazon.com/sixsecpar039-20?_encoding=UTF8&node=65 Good luck. I have a nearly 10 year old and have well and truly run out of ideas! I’m making my son a car mat (may not be completely done by christmas due to a sewing machine issue) and then getting quite a few hot wheels cars. There are so many wonderful handmade toys to be found on Etsy – many of them made with the intention of allowing your child to develop his imagination ! I have to admit, Etsy makes me a little nervous, particularly since I’m in Canada. A friend of mine did not have a great Etsy experience, and the retailer acted like it was her fault. 🙁 If I “know” the Etsy shop owner through another group, I’m a little less nervous.